The blood of Jesus covers all! 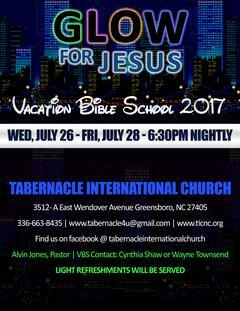 Join us on Wednesday, July 26th - Friday, July 28th for Vacation Bible School 2017. Glow for Jesus, let your light shine! Free food, fun, teachings for all ages. H.U.U.R.T. Community Development Corporation is a non-profit sector of Tabernacle International Church. H.U.U.R.T. -is an acronym for Helping, Uniting, Understanding, Reaching, and Training. Our volunteers serve the community in many ways. 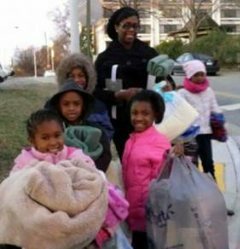 We have fed the homeless, provided shelter, provided clothing and back to school items for children who were in need. Our primary focus is to meet the needs of people in the community who are less fortunate and to help solve poverty through training and uniting with other partners. We reach people of all ages. If you would like to be a partner with us and sow into the lives of others to make a difference in someone's life, the power to produce change is in the palm of your hands. Help us make a difference today! Donate using the link below. Your gift will help us save lives! The Church where Love and Hope Abide! Fostering Total Inward Change!